More than €4 million will be invested in a digital health project to bring a potentially lifesaving smart cardiac monitoring patch ‘SmartVista’ to life. As lead partner, Tyndall National Institute will work with international partners to develop the wearable biosensor technology for real-time wireless monitoring of remote patients. 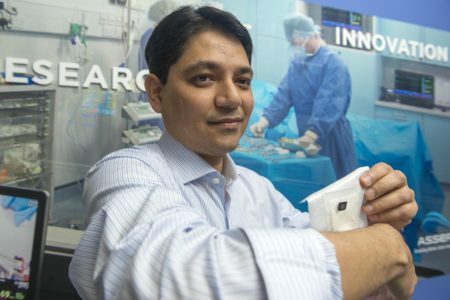 The SmartVista wearable biosensor will deliver a seamless feed of patient data, particularly heart rhythm (electrocardiograph), respiration, temperature and oxygen flow. Dr. Kafil M. Razeeb, Tyndall National Institute and Lead for SmartVista at the announcement of €4 million in funding to develop a wearable, wireless biosensor for cardiac monitoring patch. A key innovation of SmartVista is the ability to integrate nanomaterial-based sensors to monitor the heart, along with thermoelectric energy harvesters to extract energy from the body to power the system and printable battery systems to store this energy. Together these will result in a self-powered device that will autonomously monitor the electrocardiograph, respiratory flow, oxygen flow and temperature of the patient. This information will then be transmitted wirelessly for online health processing. This real-time self-powered monitoring of a patient’s health in this manner is not currently available so the technology that will be developed in SmartVista will be at the forefront of digital health and wearable biosensor technology for wireless monitoring in hospitals and of remote patients, both of which are necessary in this era of an aging population. Funding for SmartVista has been provided through the EU Horizon 2018-2020 ICT programme. Multi disciplinary partners include UCC, CNRS, Novosense, Fraunhofer-EMFT and Analog Devices. Commercial partners in the project, Sweden’s Novosense R&D Manager Fredrik Sebelius said, “This new technology could have a very significant impact on the next generation of medical sensors, enabling new functionality as well as the sensor design appearance. For Novosense this is a great opportunity to get ahead of the competition and launch a new medical device onto the global health care market following the project”.